From playtime to emergency meds, your pet will have it all! At Care First Animal Hospital, we’re proud to be your go-to source for expert care during doggy day care. 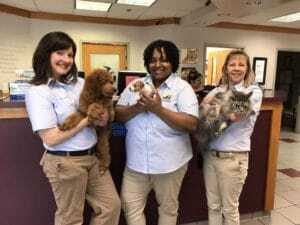 Our entire staff is dedicated to the well-being of your furry friend, which is why we offer a fun and exciting experience filled with plenty of play and rest time. Because our day care facility is located in our animal hospital, we have the resources to take care of your pet if and when an emergency comes up. Our vets are able to provide all veterinary services while your pet is at day care instead of having to schedule a separate time to come in for an appointment. If your pet gets sick or has an emergency while they’re at day care, there’s a vet on staff who can see your pet immediately. Our caretakers are professionally trained and are able to identify and work with common dog behavior patterns like separation anxiety and socialization. They are also trained to spot common ailments that our vets can treat immediately. As a unique benefit of bringing your dog to the vet’s office for day care, if we see behavior that relates to any of these ailments above, we’ll take immediate action. We’re proud to have knowledgeable and experienced vets on staff that are ready to help at any sign of an emergency. Can you give my dog medication if necessary? Yes, we can provide any and all medication – and no extra charges will be associated with it. We’ll See You at Day Care! We spend time giving your pet plenty of love and attention, while properly socializing them with other animals. No need to worry about the unexpected, our full-service animal hospital is ready for anything that comes our way. Make sure to call ahead and schedule your day care, we’ll see you soon!